On my facebook feed the other day a photo from my memories from a year popped up (because, you know, they care about my memories). 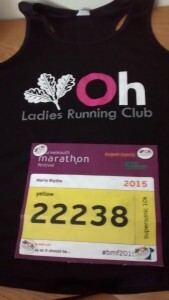 Anyway, it was my UKA card arriving as I had finally joined a running club! It’s funny looking back. When I started running, I really enjoyed the “me time” and the chance to clear my head. I also loved the flexibility- whatever time I woke up on Sunday, I could head out after getting dressed. If I was stuck in traffic on the way home, it wouldn’t matter because I could go on my own once I got home. 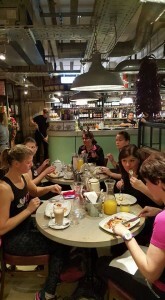 But when I started running with the Sweatshop gang I realised that I also enjoyed running with other people. Through Sweatshop I got to know one girl, and she stopped coming as had recently joined a running club that had just started up. She persuaded me to go along to a group session as a taster, and I am so glad that I did. I get quite nervous when meeting new people, but the club is still fairly small (I think they have around 60 members?) and as I have tended to stick to the Tuesday evening run, it’s been the same bunch of people for a lot of the year so I have got to know them fairly well. They also do a Sunday morning run, but when I was marathon training I went out on my own as I wanted to do certain distances and they never matched what the club would be doing. But in the autumn I started to go along to those some weeks, and really enjoyed those. 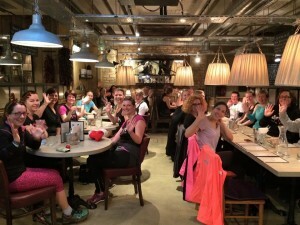 We ran new routes, and I met a few more people from the club. Our Tuesday evening runs vary a lot, and they are tailored to upcoming races which is always good. We sometimes do interval training (walk/jog/sprint between lamp posts), sometimes we do a fast 5K, other times we do a hilly route, or run up to 7 miles. We stop at certain points and re-group, which is especially good when it’s so dark. We are also made to stretch at the end, which is something I don’t always do when I run on my own. I know I should, but I don’t! It works well with my timetable too, as I usually have a late meeting on a Tuesday- I tend to get home just before 6 so by the time I have changed it is time for me to leave. I have stopped going to Sweatshop, which is a shame, but I tend to have a gentler run on a Wednesday now, to recover from the Tuesday session, plus because I get home a bit earlier, and it starts later, it would just be another evening of having a late shower and dinner. The Sunday morning runs have been good too. They use their facebook page a lot to decide on routes, so if you want to run 5 miles and others are doing 8, people will comment and usually there are a few groups heading off in different directions. There is one hilly route we do and I think I would get lost on my own, but it’s great as it is down country roads and through fields. Sometimes I have given it a miss as I want to not set the alarm, and have ended up going out on my own soon after 8am, but of course there is no expectation to go every week. I love the support at races- now when I am doing a race I will get all sorts of “good luck” messages via the club page, and one of the club secretaries keeps a spreadsheet of race times, parkrun times and pb’s, so racers even get a mention in the weekly newsletters! I love seeing photos from races pop up as well- a few weekends ago was a local 5 mile race- we were away but loads of the club were there, either marshalling or running, and it was great to see how everyone got on. I love bumping into people at parkrun too- yesterday I was overtaken by an OH lady who said “hi”- we had a quick chat before she sped off. At the finish line I met another one, and although I am perfectly happy to head to parkrun on my own, it is nice to see people you know. The social side is one aspect that has surprised me, as I am not the most sociable person. This morning we had a brilliant Christmas party. Photo from our facebook page! 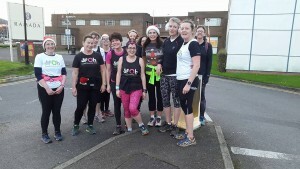 We met in Hatfield at 8am for the Sunday run- this was the 10K group. We ran to various points around town, picking up runners along the way- some people did 4 miles, some 3 miles. We were meant to be wearing Santa hats, and I wore my reindeer headband and flashing nose (on my forehead as it was hard to breath with it on my nose! ), but the adult Santa hats were too small so I was nearly the only one! We did try to play a game where if we got beeped, the person at the back of the group would run to the front, but surprisingly there were not many cars about. We did wave like lunatics to the lorries, but only managed one beep! Slim pickings! Just after 9am a huge group of us arrived in Bill’s (in Welwyn- the next town along), where we had booked to have breakfast. It was brilliant! Another one from the facebook page. We had pass the parcel with running goodies, a raffle with some running related prizes, and it was great to relax after the run. I had the pancakes, and of course a big pot of tea. Perfect. And I realised at the end, I had kept my antlers on the whole time, despite most people not wearing hats of any sort! The idea was to get the train back (not run after eating!) but another runner offered me a lift which was fab. I loved how much high-viz was on display! 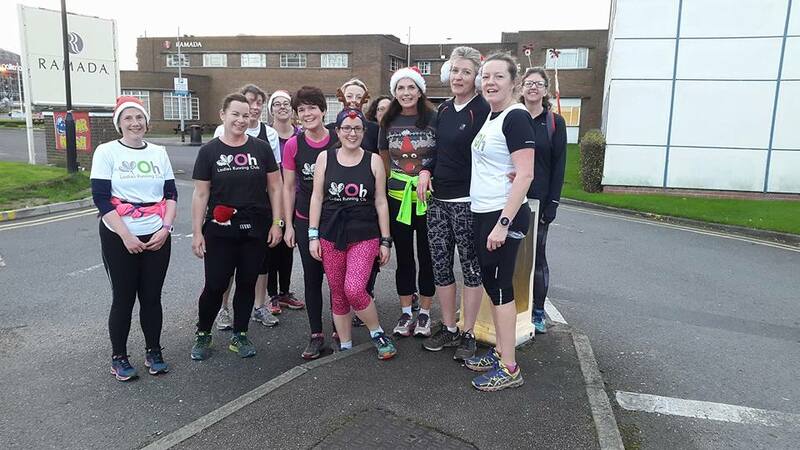 Our running club leader had recently come second place in an award for services to sport, which is amazing, and I just think it’s fantastic that so many women are out running together and setting a great example to their kids, and to other people. The club was started by a small group of ladies, and in a short space of time it has really grown. They are getting involved in a new parkrun, and hold running sessions for the university too. It’s the community spirit that makes it so great I think. This is partly why I love parkrun so much. Yes, I could just go out on my own and run a 5K and be home before parkrun even starts, but that is not what it is about for me. So, my first year of being in a running club has been great- so much encouragement and support, finding new routes, meeting new people, hearing about new races. (And of course, you save money off each race entry too!) Onwards and upwards! Yay so pleased you enjoy running in a club. I was exactly like you: I enjoyed running on my own, liked my space and didn’t think I needed a club. But it is really the best thing I’ve done for my running. I’ve gained so many good friends from the club as well. It’s such a close bond – especially when you do events like Endure 24 or Ultra 12 where you really see people at their best and worst. And training for things like marathons and the support they give. Lately i haven’t done too much training with my club as with coming back from injury I’m trying to be super cautious and not get swept away with other people’s paces or mileage. I think for Boston I will do what I did for Liverpool and do most of my long runs myself as I need to make sure I actually get there and have a good run (good as in don’t get injured, not necessarily a fast one!). But I always love parkrun as so many of my club go to it so I always see people every week. I have loved the social side of it too- it is really growing at the moment so those events aren’t too overwhelming either. It sounds like you are being very sensible at the moment with your running too- it is easy to get swept away with others. For me, I love the social side and support that comes with being part of a running club. I still really enjoy my evening runs on my own after a stressful day at work, but I like that if I want to run with somebody I can pop onto the club Facebook group and choose a run that has already been planned or see if anyone is free to head out with me. The support at races is also phenomenal from my club – it’s a really great atmosphere at every finish line! Previous Previous post: The decorations are up!